Tonnages: 14,650 gross 9,895 net 23,655 deadweight. January 1971: Completed by Haugesund Mekaniske Verksted, Haugesund (Yard No. 38) for Lyle Shipping Co. Ltd. Glasgow. Scottish Ship Management Ltd., Glasgow, managers. Maiden Voyage: Haugesund to Port Cartier, loaded grain for Japan. 1973:Re-engined by Amsterdamsche Droogdok Maatschappij, Amsterdam with two Stork Werkspoor Diesel 12 TM 410 Medium Speed Engines. 12,000 bhp 15 knots. 1982: Sold to Tanjong Shipping Co. Sendirian Berhad. Scottish Ship Management Ltd., Glasgow managers, Singapore flag, renamed TANJONG TOKONG. 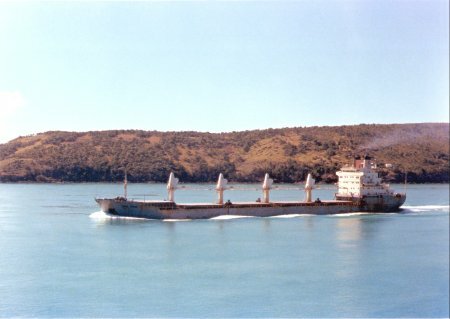 1983: Sold to Stanhope shipping Ltd. Eastern Bulkers, managers. Hong Kong flag, renamed KILINN. 1984: Sold to Twin Harbours Navigation Ltd. Naeem Sarfraz Ltd. managers. Panama flag, renamed CAPE MONZE. 1987: Broken up Gadani Beach Pakistan. Work commenced 2nd July.